MINNEAPOLIS, Minn. – Nebraska had a defensive plan heading into a showdown – if you can call an 11 a.m. kick between two 4-5 teams that – with Minnesota, but by halftime it was clear that plan had failed, and when the final horn sounded and the dust settled, the Huskers walked off the field at TCF Bank Stadium opposite a scoreboard that read 54-21. “Spectacularly unacceptable,” defensive coordinator Bob Diaco said after. 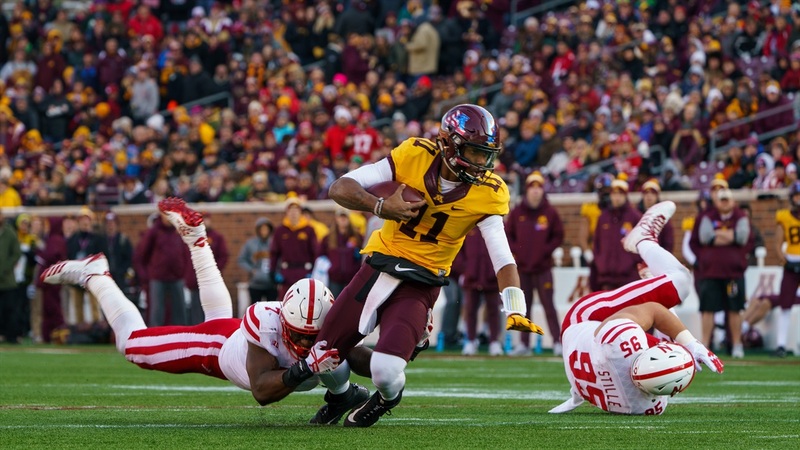 The Golden Gophers entered Saturday’s matchup with the Huskers No. 104 in scoring offense (23.4 points per) and No. 120 out of 130 programs in yards per game (319). By halftime, Minnesota had scored 30 points and rung up 311 yards – averaging 8.9 yards per play – on the Blackshirt defense. No, this latest capsizing was entirely on the defense. Nebraska could not generate stops. Only two of Minnesota’s 10 drives failed to produce points: the opening drive of the second half and the final, one-play drive in which the Gophers knelt down to run off the remaining eight seconds of clock. Nebraska could not get off the field on third down. Minnesota was 5-for-9 on third down with only two tries having 4 or more yards to go. Maybe most important of all, Nebraska was eaten alive by Minnesota’s option game. Quarterback Demry Croft – who entered the game with 154 yards rushing this year – set a Minnesota quarterback record for rushing yards in a game with 183. Tailback Rodney Smith gashed the Huskers for 134 yards on 24 carries. “We structurally had a player responsible for the hole and we had a hard time with it,” Diaco said about the breakdowns defending the read option. On several plays, Croft executed to perfection, holding the ball until the last moment before pulling and running. In those instances, Nebraska wasn’t in the right spots. In others, they just flat out missed tackles. Linebacker Mohamed Barry said stopping the read option is simple: be in your fits, find the ball, tackle. Freshman defensive end Ben Stille said everything was hitting off the edge, either outside the tackle or outside the tight end. He said they didn’t expect to see the read as much, and they didn’t expect Croft to keep it as often, but they were prepared. They just didn’t execute. Senior captain Chris Weber said when the tight end was involved, they weren’t in the right spots, weren’t on the right side of him. When Croft kept the ball, they failed to tackle. When Minnesota hit with the speed option on the edge, they didn’t get outside to cut the play off. The Blackshirts knew what went wrong: they got beat. Not out-coached (in this particular instance), not out-manned, but out-played. “We couldn’t fix the things in the second half that were hurting us in the first,” defensive end Carlos Davis said. Diaco called the loss frustrating and terrible. “You watched the bottom,” he said, and it’s hard to really feel the depth of that low, but Diaco was as visibly dejected as he’s looked all season. Nebraska has no time to waste in figuring out how to get that train back on the tracks. It faces Penn State and Heisman hopeful Saquon Barkley next Saturday, followed by Iowa at home on Nov. 24. Two top-25 teams and two absolutely necessary wins. At 4-6, the Huskers need to win out to avoid missing a bowl game for the first time since the 2007 season. That campaign was Bill Callahan’s last as the Husker head coach. This season might prove the same for Diaco and his head coach, Mike Riley. With the distractions off the field, some season-long and some inexplicably spawning just this week, there’s the chance a loss like this causes the locker room to turn. The Huskers have largely continued to fight despite a disappointing season. The toll seemed to weigh pretty heavy on them against Minnesota, but Diaco said they can’t worry. With Weber battling a stinger all week, he told the coaching staff he thought Barry should start in his place. Barry had some good plays and he had some bad plays – like most on the defense – but afterwards, he took accountability for what happened. “At the end of the day, [the coaches] can’t play for us, we wear the cleats and the pads so we have to make the plays,” he said. “We’re not losers. I’m not going to think like a loser. I’m not going to put my head down and think like a loser. I play for Nebraska. I’m a Blackshirt. I can’t think like a loser. Weber, Stille and Barry all said parts of the same whole: this season has been disappointing, but they can’t mail it in. Nebraska didn’t do that Saturday. It has two more chances to show it can.